The United Nations rose from the ashes of World War II as an organisation of "peace-loving" states. It aimed to spare succeeding generations from the scourge of armed conflict, and its Security Council - which met for the first time in 1946 - was specifically tasked with ensuring global peace and security. Once widely criticised as a talking-shop, the council has had a more active role on the world stage in recent years, introducing sanctions regimes and authorising the use of force in conflicts. Five nations are permanently represented on the Security Council. They reflect the post-war power structure that held sway when the council was formed. Members of this privileged group work alongside 10 non-permanent member countries. Each member - permanent or otherwise - holds the presidency of the council for a one-month period, on a rotating basis. The non-permanent members are elected for two-year terms by members of the UN General Assembly, the body that represents all UN members. The aim is to achieve a regional balance, with five Asian or African members, two Latin American members, one east European, and two members from western Europe or other regions making up the mix of non-permanent members. Nations compete keenly for council membership, maybe because of the prestige attached, or the chance to raise an issue that is in the national interest. Some countries announce their candidacy many years in advance and actively canvass votes. Draft resolutions are drawn up by one or more members of the council and circulated privately to the others. The drafts can be negotiated or changed in a process called "consultations". If agreed to by all members, the resolution is formally proposed to the council. Each member has one vote. Decisions on what the council calls "substantive" issues need a majority of nine votes before they can be passed, including either votes or abstentions from all five permanent members. Not surprisingly, the question of whether an issue is substantive or not is itself the subject of lively debate. Thus, each of the permanent members has the right of veto; if one of them votes against a resolution, it cannot be passed. But a resolution can be passed if a permanent member abstains from the vote. A general decline in the use of the veto, which followed the end of the Cold War, helped the council to become a more effective decision-maker. The Security Council attaches great importance to preventing armed conflict in the first place, but once a dispute has flared, its first aim is to seek a diplomatic solution. If a conflict persists, the Security Council may work towards a ceasefire and deploy peacekeepers. It can order UN nations to impose sanctions and, as a last resort, it may authorise military action against an aggressor. The status quo of the permanent members had not changed since the council's first meeting in 1946, and the make-up of the Security Council has climbed up the UN agenda. Change faces numerous hurdles, but the likelihood of reform was seen as having been boosted by an announcement by President Barack Obama that the US has backed India's ambition to become a permanent member of the UN Security Council. India, Germany, Japan and Brazil - known as the G4 - and the African Union are among those who have long lobbied for coveted permanent-member status. A working group on reform set up under the UN General Assembly in 1993 had made little progress on the matter, with a lack of consensus over potential candidates. The then Secretary-General Kofi Annan warned the lack of reform could weaken the council's standing in the world. The Security Council came under strong pressure from US President George W Bush in the run-up to the 2003 US-led Iraq campaign. Mr Bush cited Baghdad's "decade of defiance" of Security Council resolutions. "Will the UN serve the purpose of its founding... or will it be irrelevant," he asked in a speech to the General Assembly in September 2002. 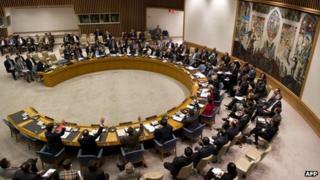 The Iraqi crisis tested the Security Council's credibility and authority to the limit. Resolution 1441, passed by the council, demanded that Iraq disarm and cooperate with weapons inspectors. But some permanent members, including France and Russia, disagreed with the US-UK assertion that 1441 allowed military action. With France proposing to veto a second resolution authorising action, the decision to go to war was made without Security Council approval. The failure of diplomacy was seen as a bad portent for the Security Council's future prospects. More generally, the Security Council has been criticised for not taking forceful action until a catastrophe or conflict unfolds, even when this might have been predicted, as in the Rwandan genocide of 1994. Mindful of this, and the bombing campaign against Yugoslavia in 1999, which was undertaken without council approval, leaders of all 15 member states met in 2000 to adopt measures that would give the organisation more teeth, including a review of peacekeeping operations. More recently the Security Council has acted with greater decisiveness. It has imposed sanctions on North Korea and Iran over their nuclear programmes, and authorised a no-fly zone over Libya that helped indirectly to bring down the Gaddafi government. Cold War fault lines endure, however, as became evident when Russia and China in 2012 vetoed a series of Security Council resolutions aimed at putting pressure on the Syrian regime of President Bashar al-Assad.